Gunma Prefecture (群馬県, Gunma-ken) is a prefecture of in the Kantō region of Japan on the island of Honshu. Its capital is Maebashi. In the Meiji period, Gunma was created from land which was in Keno Province and Kōzuke Province. Gunma is in the northwestern part of the Kantō Plain. It is mostly mountainous. Gunma shares northern borders with Niigata Prefecture and Fukushima Prefecture. 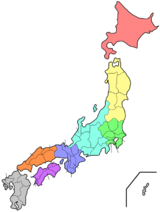 The prefecture's eastern border is shared with Tochigi Prefecture. To the west lies Nagano Prefecture. Saitama Prefecture is south of the prefecture. National Parks are established in about 14% of the total land area of the prefecture. Ichinomiyanukisaki jinja is the chief Shinto shrines (ichinomiya) in the prefecture. ↑ Nussbaum, Louis-Frédéric. (2005). "Gumma-ken" in Japan Encyclopedia, p. 267; "Kantō" in p. 479. ↑ Nussbaum, "Maebashi" at p. 600. This page was last changed on 31 August 2017, at 02:49.